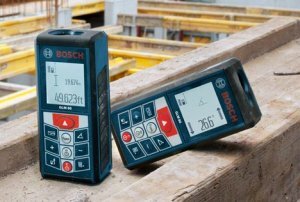 If you don't own a laser distance measurer yet, you have no idea what you are missing; and with Bosch's introduction of the GLM 80, the reasons are growing more and more with every new release. I still use my old Bosch DLR165 at work all the time even though it doesn't have an inch only measurement, and I would be lost without it. The new GLM 80 has so many improvements over the previous models that don't know where to begin. Probably the most exciting feature would have to be the built in two-axis tilt sensor that allows to laser to do indirect measurements while requiring you to only take one measurement. This feature goes beyond the Pythagorean theorem of other lasers and takes us into trigonometry. Thankfully for us we don't have to remember any of formula involved. All of the other measurement modes are also covered, like area, volume, continuous, minimum, maximum, multi-surface area and multiple indirect measurements and the laser has a maximum measuring distance of 80 meters (262 feet). The same tilt sensor also automatically rotates the back-lit display of the measurer so that it is always right-side up. By using the R 60 attachment, the GLM 80 can be mounted inside and used as a digital level. Another major change on the GLM 80 is its use of a chargeable lithium-ion battery. The battery can achieve up to 25,000 measurements with a single charge, and can be charged with an included micro-usb charger. Because the micro-usb port is standard, you should be able to use vehicle chargers from certain phones to charge the measurer.